Who’s Spraying Whom? And with what? Since the 1940’s or earlier, someone’s been seeding clouds with various chemicals and particles. What are they doing TODAY over our land called America? You ARE aware that what bugs me is some group is spending a lot of money on this and where is the money trail leading? There is so much need in the world and someone is playing god with the weather and trying to control or modify it. Posted on August 22, 2011 Categories UncategorizedTags seeding spraying clouds "behind the scenes" "and we just go along our merry ways"Leave a comment on Who’s Spraying Whom? And with what? 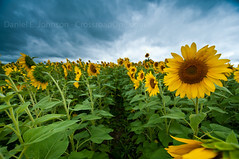 This past weekend can be pretty much summed up by this photo of a field of sunflowers blowing in the wind. Fast, colorful, and fun with some adventure ahead. I toured the central and eastern peninsulas of the Traverse City area, visited a few of their wineries, and ended up cruising with friends for a while on Torch Lake. These sunflowers were near Elk Rapids, Michigan. Personally, I think I ate too many times but the meals were excellent. Thank you to Dale DeVries for being a great host, tour guide, and actually a pretty good captain of the yet to be named boat we were safely cruising in. A great weekend with friends is now in the record books. A very windy afternoon blew us by this sunflower field in Northern Michigan near Elk Rapids, Michigan. Posted on August 16, 2011 Categories UncategorizedTags "Traverse City", adventure, clouds, farming, fleids, Michigan, photography, sunflowers, tourism, travel, wind, windyLeave a comment on It’s a Wrap.